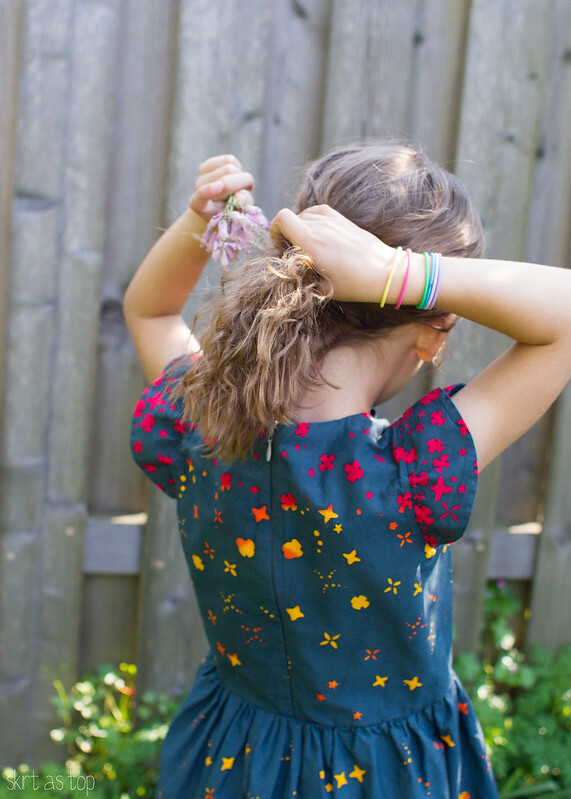 i have missed more regular blogging and i figure kid’s clothes week is a great reason to stay up late for the good of the cause (and to get back in the swing of things!). sewing and blogging keeps me sane, so i really need to try to make more time for it again…we’ll see how it plays out. it is springtime, after all, and it’s been a sunny one for us here! 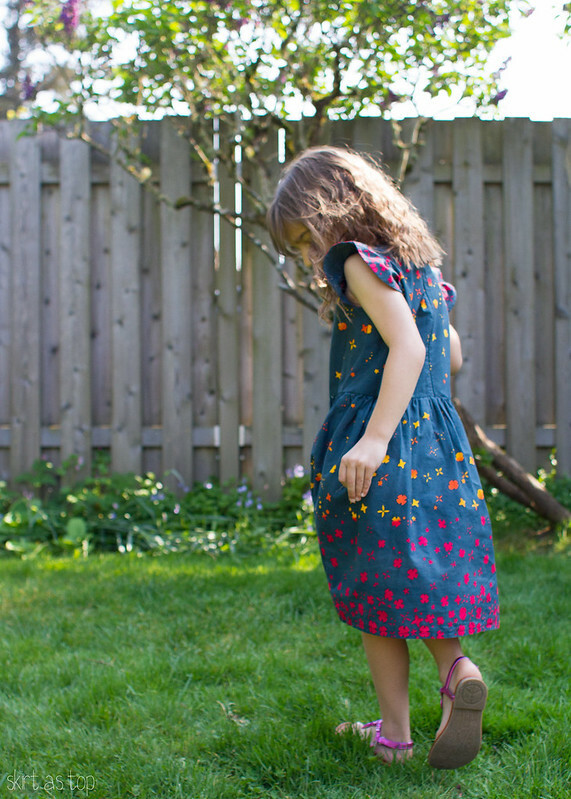 so anyway, i thought i’d kick off KCW by clearing one out of my “to blog” queue…Em’s Easter dress. doesn’t look much like the pastel numbers you normally see, eh? but it’s springy just the same! i’m not really sure which to start singing the praises of first, the GOOOOORGEOUS fabric or the pattern i know i’ll reach for again and again? hm, let’s go fabric. 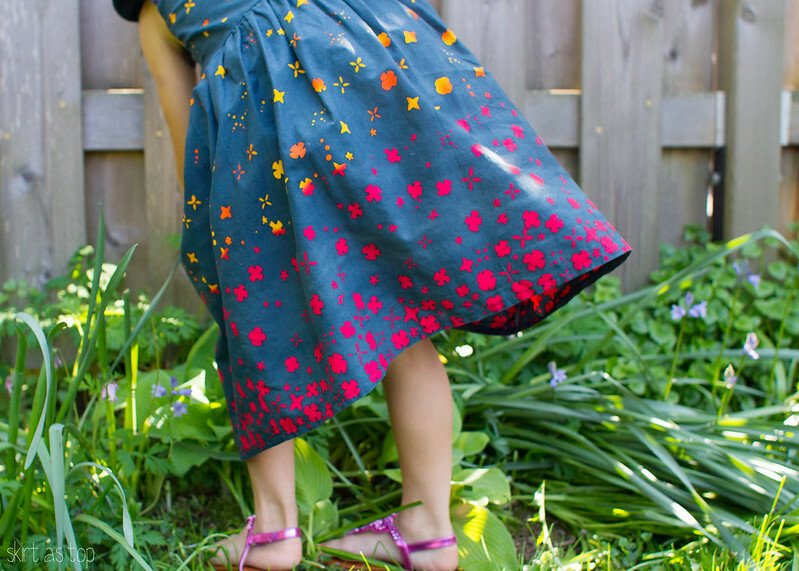 this vibrant batik is Alison Glass’ Handcrafted line for Andover, which i was given by my sponsor, LiMa Sews and is called “petal in charcoal.” it’s still available right here. have you seen this amazing line of fabric in person? i’m a color freak, and the colors in these fabrics are super rich and delightful. i could buy yards and yards of the whole Handcrafted line and happily sew with it for years to come. i tried to make these photos show how truly beautiful the colors are; in person the reds/yellows/orange flowers seem to glow against the deep charcoal/navy, like they’re on fire. 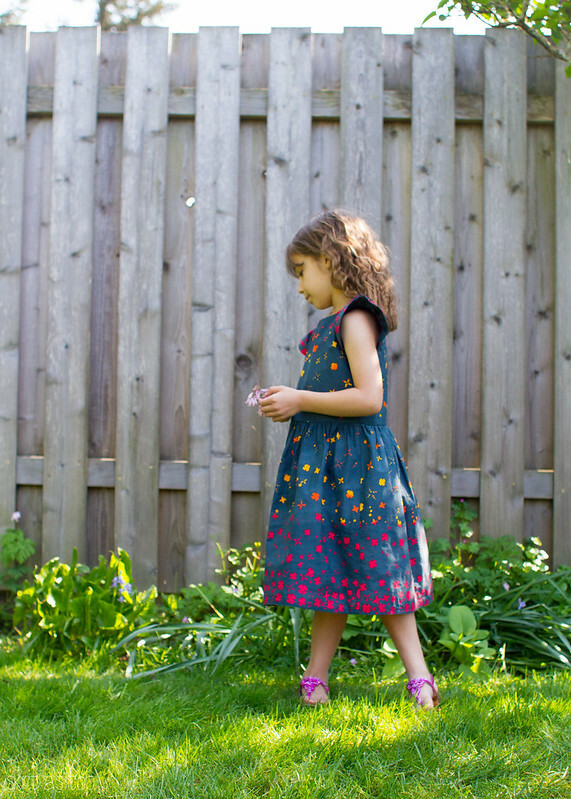 i wanted a simple design to showcase the fabric, and i also wanted to try something new, so i FINALLY gave the Hanami Dress by StraightGrain a whirl. i had considered sewing a Hanami for Em’s Christmas dress but ended up making a Fairy Tale instead, so Easter seemed fitting. i’ve always been inspired by my friend Rachel’s many Hanami/Hanimis and Erin’s work with Handcrafted here and here, and i was glad the pattern lived up to the hype! i really enjoyed sewing it and it was quicker than i expected, too! i sewed a size 6 (!) but made a couple changes to the proportions. i took 1” off the bodice length and added 1” to the skirt so it’d hit right at her hip but i wouldn’t lose overall length, and the proportion seems right to me. 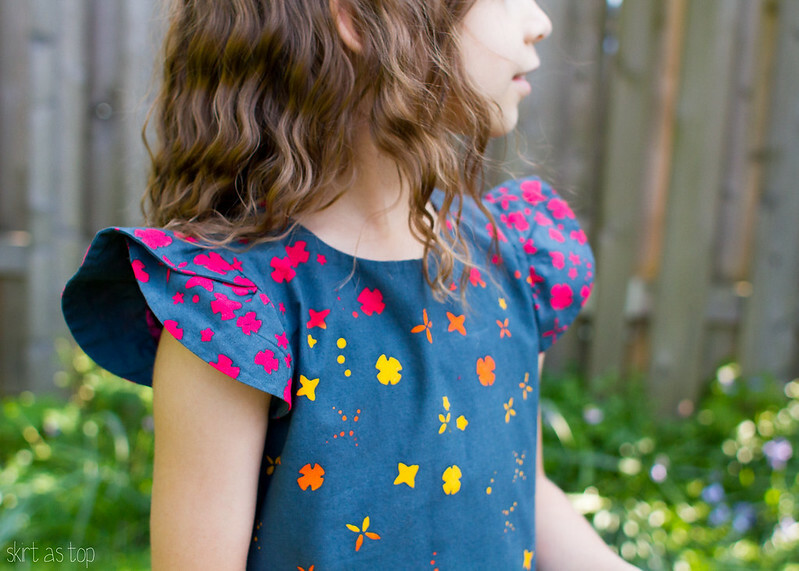 i also overlapped the tulip sleeves more than instructed so they didn’t flare out quite as much – hard to explain but i overlapped them one more dot than the pattern says to…it created less gathering at the shoulder when i attached them to the armhole, but still gives the pretty butterfly wing effect. i’ve got one more photo that reminded me of Rachel and her sweet daughter Indigo – E and Indigo sometimes text instructional wildlife videos back and forth to each other and to me Indigo is a preview of what E might be like in a year or so. both are smart, confident, articulate gals with giant hearts. greatest thing about blogging? making friends all over the country/world. hardest thing? living so darn far away from most of them! 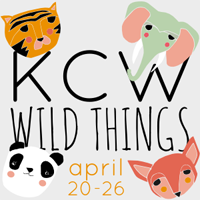 anyway, the theme for this kid’s clothes week is “wild things” which is totally inspiring and i want to play along – hope to be back here soon with something animal-ish! Oh that fabric is gorgeous! Very spring-looking. I’ve missed your regular blogging too. Especially because I always seem to copy cat you. ;). I’m definitely feeling more sane now that I’m getting back in a good sewing/blogging rhythm. Those few months over the winter where I barely sewed, I about went crazy! Kristin, Love the color choice for E’s Easter dress. I chose a very different pallet for baby layette for our expected little nugget. Using the unusual colors and patterns energizes me and adds something special to the usual neutrals used for baby & kids clothing. Beautiful fabric! I like your dress even better than the usual pastel easter dress, and it will look great all summer. Beautifully accessorized by Em (are those hair ties as bracelets?)! this is an amazing version of my favorite pattern love it! Oh, I love this! I’m not much for pastel colors, so this definitely speaks to me. I fell off the blogging train a while back, but it feels good to be writing again! And you always make the best stuff, so I love seeing you pop up in my reader! That fabric is gorgeous and is perfect in that pattern! Love it! This dress is just SOOOOOO pretty! The fabric! THE FABRIC. Ahhhhh. I love it so much, perfect choice for the Hanami. Beautiful photos. I love this fabric! I bought it recently for a top for me! But it’s lovely to see it in a dress. I just need to settle on a pattern and then I can’t wait to sew it up! Holy heck! This dress is amazing. Not only is it gorgeous but the colors and your design tweaks are perfect!! 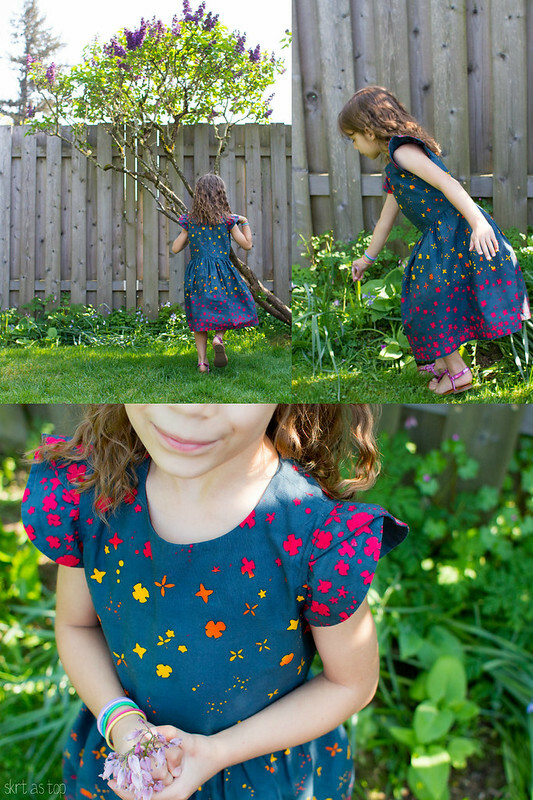 Beautiful dress – the Hanami is a wonderful pattern, and I absolutely love it in this fabric! This is absolutely stunning. probably the prettiest fabric/dress combo ever!! Stunning! Perfect fabric choice for an Hanami dress.